When a pedestrian is hit by an automobile, the results can be devastating. Although only about 11% of travel in America occurs by foot, pedestrians make up around 13% of vehicle-related deaths each year. Most of these pedestrian deaths occur in urban areas at night in non-intersection locations. Left-hand turns. An estimated three times as many people get hit by cars turning left than by cars turning right, even at intersections with signals and crosswalks. This is because drivers making left-hand turns are focusing their attention on whether other cars are coming and whether it is clear for them to turn, forgetting to look for pedestrians. Distracted drivers. Many pedestrian accidents occur when the driver is not paying close attention to the road. Distracted driving may occur when a driver is talking on a cellphone; texting, emailing, or otherwise using a smart phone; adjusting the radio or air conditioner/heater in his car; manipulating a navigation system or tending to children sitting in the backseat. When a driver takes his focus off the road for even a second, pedestrians are put at risk. Unmarked crosswalks. While many intersections have lined, designated crosswalks, many also do not. The absence of clearly marked crosswalks can lead a driver to forget to look for pedestrians, thereby increasing the risk of pedestrian accidents. Distracted pedestrians. Electronics are not only bad for drivers; they can also be quite dangerous for pedestrians. 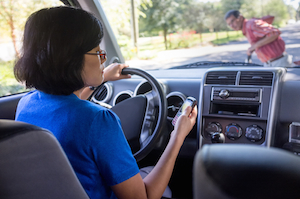 When a pedestrian is looking down at an electronic device (phone, computer, music device), he or she is likely not paying proper attention to the surrounding traffic. Impaired driving. Drivers operating a vehicle under the influence of alcohol or a narcotic are far less likely to see a pedestrian or be able to respond appropriately if a pedestrian is in the roadway. Drinking and driving greatly increases the risk of pedestrian injury. Speeding while driving. When a car is going faster, the driver may not have the time required to react to an upcoming pedestrian. Speeding also increases the potential severity of the injury to the pedestrian. Rolling stops. When a vehicle fails to make a proper stop at a stop sign or traffic signal, the driver may not notice any nearby pedestrians. Inexperienced drivers. Drivers with less experience are less likely to know where pedestrians tend to be present, and they are less likely to look for and properly respond to pedestrians. Improperly installed or defective traffic lights. Since both pedestrians and drivers depend upon the proper functioning of traffic signals, a defective traffic light or pedestrian signal can lead to devastating results. Failure to slow down in school zones. Children are especially likely to be involved in pedestrian accidents, and safety in school zones is paramount to reducing these risks. Failure to follow traffic laws. Making illegal u-turns, failing to follow posted directional signs, and speeding contribute to pedestrian accident risks. Pedestrian negligence. In addition to the mistakes drivers may make, pedestrian mistakes can contribute to the risk of pedestrian accidents. For example, darting into traffic and failing to use sidewalks or designated pedestrian areas can increase the risk of an automobile-pedestrian accident. If you or a loved one has been injured as a pedestrian, contact us for a free, no-obligation consultation about your case. One of our award-winning lawyers will discuss your case with you for free and let you know whether we can help. We handle all pedestrian accident cases on a contingency basis so we only get paid if we win. Call us at 615-742-4880 or toll-free at 866.812.8787.